The progress on Easy Street is like a turtle – slow and steady. I am considering using the grey for the inner border and green for the outer border, but will wait until the center is completed for the final decision. 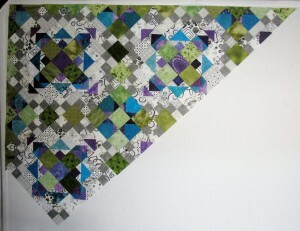 I am also trying clean my sewing room and put away the purple, turquoise and green fabric from this quilt. However, I am so easily distracted. 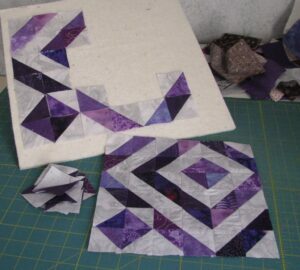 While putting away the purple, I started cutting out turquoise triangles from the 2″ strips to make this block. The block is called Diamond Ripples from the Modern Blocks: 99 Quilt Blocks from Your Favorite Designers. Since the first time I saw this block, I was curious about the design that four blocks would make. It will be fun to play with different layouts. This project is going to be a doll quilt for a soon-to-be second birthday. I really need to be careful looking through my quilt books and magazines. I see a quilt pattern, think “I have the perfect fabric to make that”, and then new project is started. This third quilt project came about in exactly that way. This pattern is called the Wavelet from Jane Miller’s book French Braid Transformation. I decided to make this quilt with the leftover purple and turquoise fabric from Easy Street along with some red from my stash. 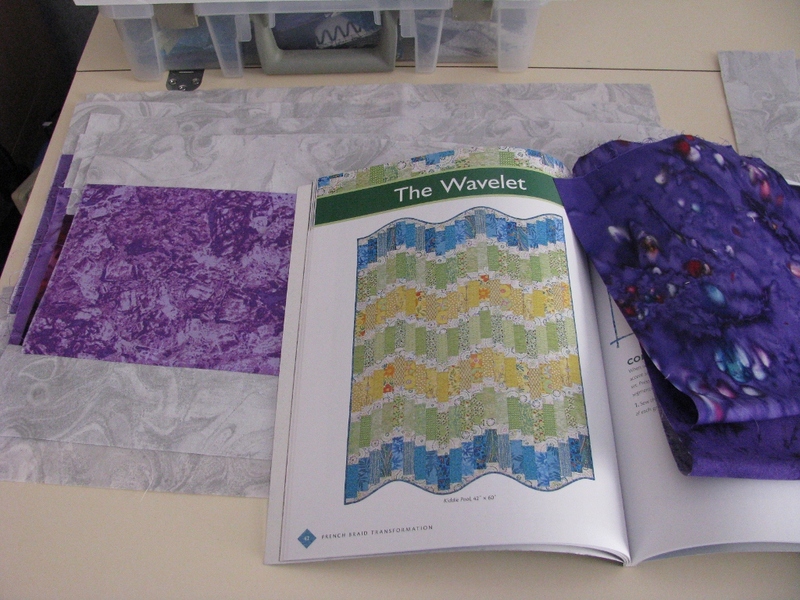 And yes – that is the same background fabric in both the doll quilt and the Wavelet. Since the doll quilt has a deadline, that will be the first finish for 2013. 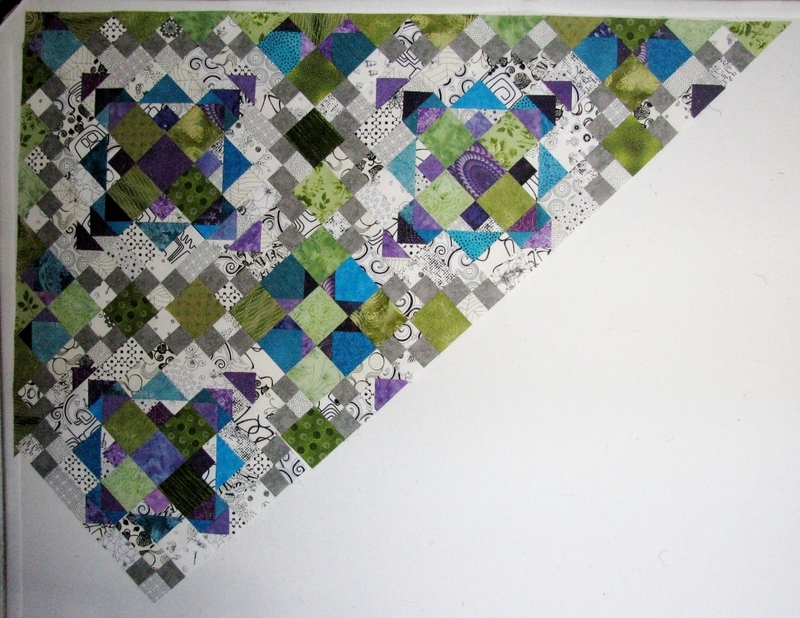 Check out all the quilty progress at Design Wall Monday and Easy Street Link-up. “I have the perfect fabric to make that” is way better than “I’m going shopping to find the perfect fabric to make that,” which is what I do. Your Easy Street looks great. I haven’t started assembling blocks yet. I love the purple quilt. However, the wavelet quilt piques my interest. I think that when you have the fabric sitting right there for a perfect project why not start it??? You have some winners there, love it! You are about as far along with ES as I am. And for the same reason: involvement with other projects. I love your purple. I think I need a purple quilt, too. Easy Street is looking good. Love the purples and I agree with Vicki, that wavelet pattern is interesting. Great projects. Your Easy Street is gorgeous – I love the olivey greens. Yes, flicking through quilty magazines is deadly for starting new projects!